Here's the last piece of the "test" pumpkin pie. Tom already devoured the remainder. I didn't make the crust edges as fancy as I will for next Saturday's Thanksgiving dinner. The starlings seem to have made this abandoned bushbaby house their new nest. We'll see how it goes. The test pie was a hit. The first night Tom consumed half the pie and went to bed feeling satisfied but full and bloated. Last night, after returning from dinner at Jabula and Rita and Girard, he ate half of the remaining ½ of the pie. Tonight, he'll finish it off. I must admit, I took a single bite and literally swooned if I say so myself. Keeping in mind I hadn't had a taste of flour or sugar in over seven years, my taste buds went soaring. I had to go to bed to prevent me from asking Tom for another bite. "Little" came back for more pellets on the veranda. He feels quite at home here. Who knew pigs climb stairs? It wasn't easy preparing the filling from a bag of frozen pumpkin. First I cooked in the microwave from its frozen state in a large glass bowl. This took a good 30 minutes since the microwave doesn't seem to be able to cook on high. Once I could test it to find it was s very soft, I placed it in a colander and pressed out the liquid with a rubber spatula letting it drain for a while to ensure most of the liquid was gone. Elephants coming down the embankment to the Crocodile River. Then, in small batches, I placed it in the food processor in order to make it smooth comparable to canned pumpkin. It was very messy but, it came out nicely. Then I proceeded to make the pie filling using homemade pumpkin pie spice. There's always some good vegetation for them to consume on or near the river. Once that was completed, I made the pie crust from scratch using the best pie crust recipe in the land from Martha Stewart again using the food processor to make it into a perfect ball. I pressed the dough into a round disc after wrapping it in parchment paper and let it rest in the refrigerator for an hour. Using a washed full bottle of wine as a rolling pin, the dough rolled into an even circle with little effort. The mongooses are also becoming rather brazen as they too come up to the veranda steps to let us know they'd like some eggs. From there, I pinched a makeshift edge knowing no one else would see it (duh! ), filled it with the pumpkin filling and placed it in the oven. The oven also cooks very low even though it appears to be at a high temperature. Improvise, I remind myself. It took 90 minutes for the butter knife to come out clean. Mission accomplished. Now all that was left was the taste test which Tom embarked upon with glee on Friday night. He hadn't had one of my homemade pumpkin pies in over seven years. That's one big gulp from the elephant of the left. I watched his face with bated breath as he took the first bite. Then, the second. A smile washed over his face and I knew he was content. The pie passed the test. So far today, we've yet to see a single kudu, bushbuck or warthog. Where is everyone? Making the remaining pies on Friday will take an entire day but its a vital part of the tradition of Thanksgiving dinner. Although we'll be having roasted stuffed chickens instead of turkey (no turkeys anywhere to be found), otherwise we should be on track thanks to friend Kathy for finding many of the vital ingredients and Louise for finding cranberries and spices on a recent trip to Nelspruit. It gave me peace of mind to know we'll have good tasting pumpkin pie for next Saturday's dinner. We'll see how the remainder of the meals works out from there. Yesterday as often is the case Ms. Bushbuck and Baby stopped by to check out the pellet situation. So far today, we haven't seen a single visitor. We heard there was a live concert in Nelspruit last night by a popular South African performer and most hotels in the area were booked. This two-tone giraffe with light and dark spots is taking a rest from standing on those tall legs. This may have attributed to more holidaymakers coming to stay in Marloth Park over the weekend. We could tell by the numbers of cars on the roads and the lack of wildlife in the garden that something was up. This is the first morning in nine months we haven't had a single visitor other than a few birds and Frank and The Mrs.
With less hair on the end of his ossicones, most like this is a male. Last night, we had another fun, delicious and entertaining evening at Jabula Lodge and Restaurant with Rita and Gerhard who are leaving tomorrow for a few weeks. 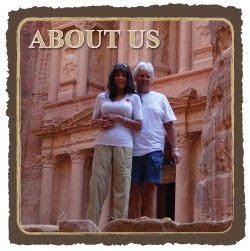 (Owners Dawn and Leon always add to a great time by laughing and interacting with all of us). "Thanks for stopping," she says with somewhat of a smile on her pretty face. We're looking forward to their return to Marloth where they'll stay for another three months, leaving about the same time we're hoping to leave in February. The good times will continue. Today, most likely we'll head out on another drive in the park to see what we can find that may be of interest to us and to our worldwide readers. Thank you, dear readers, for hanging in there with us over these past nine months. Lots of cape buffalos on the river bank. We arrived here exactly nine months ago today, on February11th and if all goes well, we'll depart in three months, nine days. We'll see how it rolls out with immigration soon enough. Another of Tom's wonderful bird photos in Atenas, Costa Rica, in this case, a small green parrot. For more details, please click here.